This entry was posted in Automotive, Emergency and tagged Car Security, Theft Prevention on April 24, 2015 by Locksmith Sarasota. There’s no question that car security systems have become more sophisticated over the years. 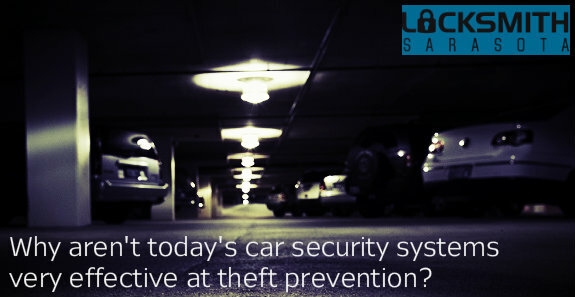 As technology has become more advanced, would-be thieves have also adapted and become more clever at finding ways to dismantle, disable, or simply get around the anti-theft devices that we use or install on our vehicles. While there is no way to completely eliminate car theft, we can be vigilant about our vehicle protection and get smart about safety, including consulting with an emergency Sarasota locksmith for advice. These theft prevention devices are common on most newer vehicles. The problem with them is that they no longer really act as a deterrent to car thieves. 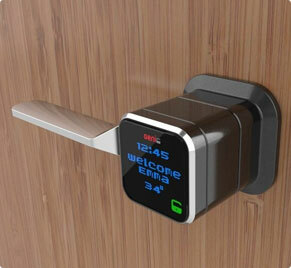 Once the theft is in progress, a thief who has a bit of experience will find them very easy to disable. Tracking systems use a GPS transmitter to track the vehicle and cellular technology to communicate with the monitoring center. Radio technology is typically used to recover stolen vehicles. These systems are very effective, but have limitations. OnStar, one of the best-known brands, is not available to all vehicle owners. It is only offered to GM customers. The first year is free; however, subscribers have to pay approximately $200 per year for the basic plan for subsequent years to continue the service. LoJack is available as an alternative, but only in 26 states. It costs about $700.00 to install and is about 90 percent effective at recovering stolen vehicles. Unless you are looking to protect a higher-end vehicle, this is probably not the best choice for you. This type of anti-theft device is often offered as standard in higher-end vehicles. Smart keys can prevent thieves from starting your car if they don’t have the correct key and can prevent hot wiring. They don’t however prevent crafty thieves from hitching your car up to a tow truck and simply towing it away, stripping it for parts or breaking in and stealing your possessions. Car security is just as important as home security. At Locksmith Sarasota, we understand that our customers want to feel safe and protect their property.